NAPA, Calif. (KGO) -- A massive effort is underway to serve the thousands of first responders, police officers, fire victims themselves and anyone volunteering to help those affected by the Napa fires. National organization Operation BBQ Relief teamed up with Napa's Woodhouse BBQ owners Vince and Christina Sanchez to make it all happen. Since Tuesday, the team has grilled and smoked and expertly prepared and served over 10,500 meals to the community with the help of donations from various Napa restaurants and vendors. Work begins at 4 in the morning and sometimes doesn't end until 11 at night. 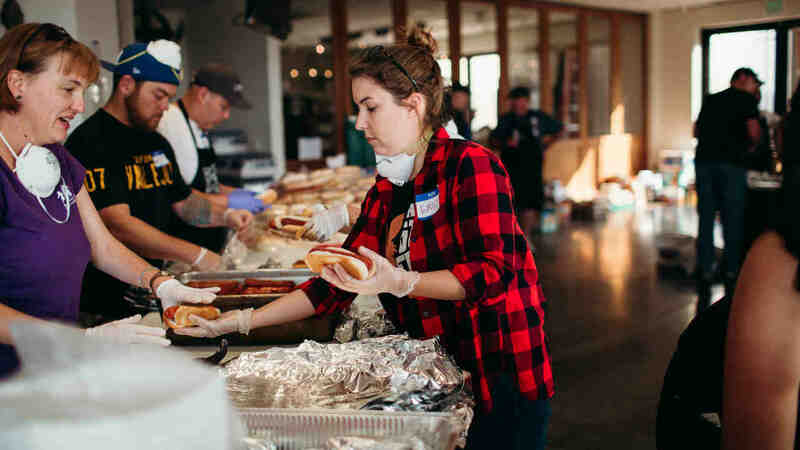 With help from volunteers in San Francisco and Oakland, meals are not only served on-site but are distributed to various organizations in Santa Rosa. Some firefighters working double and tripe shifts reported the BBQ was the first meal they had eaten in 12 hours. If anyone is interested in volunteering or needs a hot meal, Operation BBQ Relief and the Woodhouse BBQ team can be found at 388 Devlin Road in Napa. They plan to be at the location until at least Wednesday, or as long as help is needed.